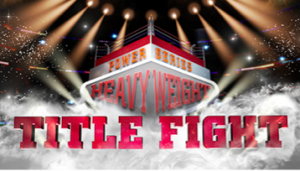 Every Sunday from 6 Nov, Party Poker’s The Title Fight gives you a chance to stand your ground in the ring and walk away as a title-holding winner. You can qualify directly with a $215 buy-in or satellite your way in for just $0.01 with an active Party Poker account! You can collect tickets for the tournament playing satellites starting at just $0.01, via Ticket Steps starting at just $0.10 or buy entry in the PartyPoker Points Store. Ticket Steps are quick 6-handed Sit & Gos where you can grind your way to win high-value tickets starting just $1.10. Find them in the ‘Sit & Gos’ section.